Chef Reuben Riffel - what it takes to achieve success. Reuben worked as a kitchen hand under a French chef, where he was taught to make potato gratin and to debone legs of lamb and tie them. “I was very scared of everyone, but was loving learning new things,” he explains. “Shortly afterwards chef Richard Carstens took over, and I still wasn’t always sure it was for me. I was working long hours while my friends were chilling at the beach. But I stuck it out. Reuben’s childhood in Franschhoek involved gardening, food gatherings and family. These elements played another important role in shaping his culinary career from a young age. He regularly helped his grandfather harvest fruit and vegetables from his garden. The family slaughtered chickens and pigs on occasion, and shot pigeons to eat. “It’s nice to see a cool butchery, but we must understand where our food comes from,” he says. Reuben’s first big career opportunity came about when Franschhoek’s Monneaux restaurant was looking for a head chef. “I think I showed I had a knack for cooking,” he says. Chef Carstens recommended Reuben for the job, and the next year Monneaux made the Eat Out guide’s Top 10 restaurant list. “That’s where people started to notice me,” Reuben grins. Local work offers came rolling in, but he stuck to his plan: Reuben wanted overseas work experience, which is important for any chef. He was given the opportunity to open a restaurant in Cambridge, England. But it wasn’t long before former customers from Franschhoek tracked Reuben down and offered him his own restaurant back home. The offer was too good to refuse. The chef returned to South Africa and Reuben’s opened in Franschhoek in 2005. 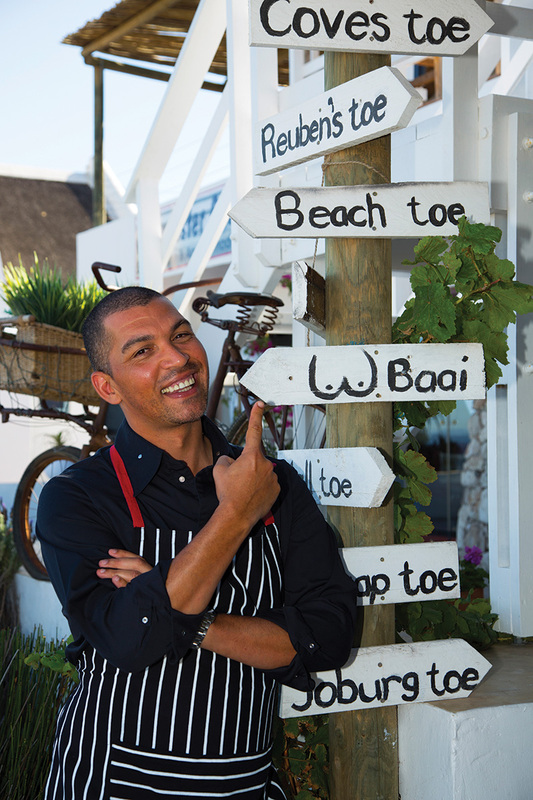 Reuben Riffel hit the jackpot as a chef in 2006: Reuben’s restaurant won both the Eat Out ‘Restaurant of the Year’ and ‘Chef of the Year’ awards. Initially Reuben says he focused on being a great chef. The awards put him under pressure to maintain standards, so what was supposed to be a casual family restaurant morphed into a sought-after upmarket bistro as word spread. But once his kitchen was under control, Reuben changed tack and started taking the opportunities on offer to him in business. He still owns the flagship Reuben’s restaurant in Franschhoek. But in recent years Reuben has trained chefs and empowered them to operate restaurants that he oversees in a consulting role. They include the Reuben’s One & Only, Robertson’s Reuben’s at the Robertson Small Hotel, Reuben’s at Abalone House in Paternoster, and Franschhoek’s Racine at Chamonix winery. Reuben’s super-organised wife Maryke is very involved in running his businesses, and is also his manager. Together they own a KitchenAid shop in Franschhoek, and Reuben has produced three cookbooks. Aside from being a MasterChef SA judge, he is paid to endorse Robertsons Spices in advertisements. Does being a celebrity affect Reuben? In the beginning he admits he was taken in by some of the hype that people wrote about him. “But I’ve realised you must portray yourself as you are,” he says. When people ask for autographs and pictures now he humbly obliges, but doesn’t buy into the celebrity thing. Operating so many restaurants and other businesses means Reuben isn’t in a kitchen daily. “If you talk about cheffing, we’re being judged all the time by diners. When a customer goes to a restaurant, they usually look to the chef as the person responsible,” he says. “I’ve been lucky that I built up a core group of chefs who assist me in what I do. Sometimes the staff have personal issues that affect my businesses, and then we invest more time in sorting that out.” Reuben focuses on the cookbooks and TV endorsements, while his chef team mostly run the restaurants. “I’m still involved, but they have to buy into what we’re about and take ownership of it,” he says. Don’t mope at home if you lack chef experience. If you’ve studied and are sending out your CV, ultimately experience is king. But as an employer I’m not even going to look at a chef who’s just sitting at home. Get a job as a waiter and interact with people. We had a waiter at Reuben’s One & Only who’s now selling Ferraris at Viglietti Motors because a customer noticed his skills. Start small and look for opportunities around you. Why don’t more people grow vegetables and supply good restaurants? Start a small café, or take a food stand at a market. Many young chefs return from the UK and Dubai after working for big-name chefs, and want to open a fancy restaurant. If you have a new product, a good investor and the pricing is right, then fine. But test the waters and be sure there’s a market for what you’re offering. In smaller communities, you need the buy in of the people that will become your customers. As a chef, learn the restaurant business. Or find a partner who is good at food costing, to have a viable business. Don’t only focus on chef skills. Do your homework and you’ll see many new restaurants fail because they don’t get that right. Have a master plan when you start. The beginning of your cheffing career should be about gaining maximum experience. That means working at many good establishments, because every chef works differently. Too many chefs work for one boss for too long. Don’t be unrealistic about remuneration. A lot of chefs work at hotels because salaries are better. You can gain good experience, but don’t do it only for the money or eventually you’ll get stuck there. If you think you want to be a chef after seeing celebrity chefs on TV, Reuben suggests volunteering for some kitchen holiday work to see what it’s about. Cape Town and Winelands Silwood School of Cookery, Rondebosch. South African Chefs Academy, Observatory. Institute of Culinary Arts, Stellenbosch. Joburg and Pretoria Prue Leith Chefs Academy, Pretoria. HTA School of Culinary Art, Randburg. Durban and Midlands Jackie Cameron School of Food & Wine, Hilton. The Fusion Cooking School, Durban. 1000 Hills Chef School, Botha’s Hill. Interested in becoming a Chef? Visit chef career page for a career overview, qualifications needed, where to study, school subjects required and a career interview.